Ok guys, here is a quick one. 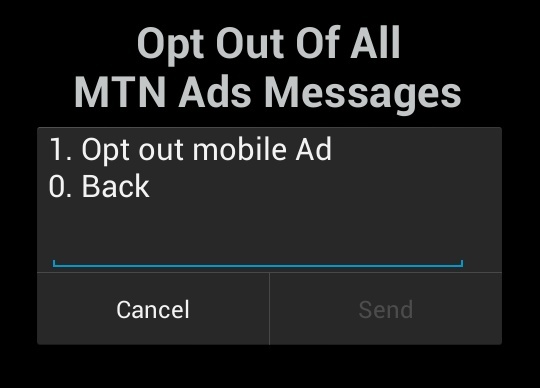 After so much legal tussle and fines, MTN has finally provided a quick Avenue to opt out and deactivate all of MTN mobile ads on your phone. This means that to stop all useless text messages and spam messages on MTN you can now dial the provided code without calling Customer Care or save yourself the stress of unsubscribing from the advert services one by one. You can also deactivate Airtel ads too. No more 32043, 33070, 5010, 4100, etc. Especially Isa49v........ Only Bank Credit Alerts, your friend's marriage invitation (lol) and ITyUNIT notifications. 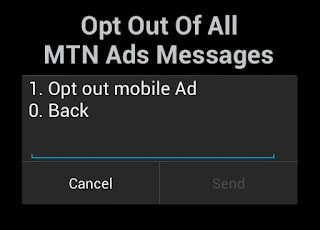 To opt out of all MTN useless adverts, dial *123*5*4# and follow the simple instructions. For airtel just dial *902# and follow the instructions. Be free from the frustration of spam messages alert, also share the info and this post with your friends by clicking the Facebook and Twitter button below. *902# absolutely works on airtel nigeria. When you dial it you will be asked to start or stop an service. I selected stop and a list of all the sms content I was subscribed to popped up and I selected the ones i wish to opt out from. I also got a message to confirm that I've been unsubscribed. I wish there is a similar service for etisalat. I just checked again, it works. You can only opt out of active services you have subscribed to.